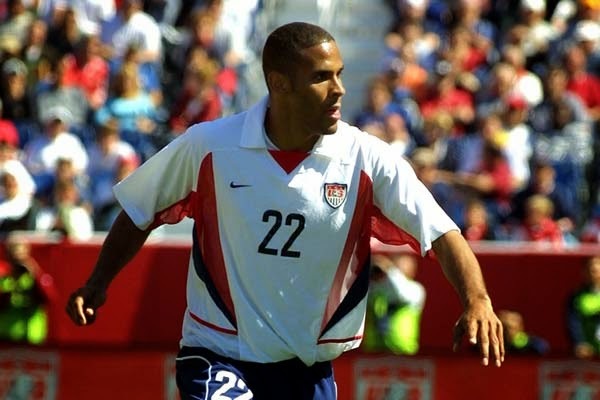 This week for 10 Questions With a Pro we had the pleasure of picking the brain of Tony Sanneh. Tony spent 15 years playing professional football in the US and Germany, and was a crucial part of the USA Men's National team that made a run to the quarter-finals of the 2002 World Cup in Japan and Korea. In that World Cup Sanneh played every single minute in all of his country's matches. FootyFair: Coming from St. Paul, Minnesota, what made you choose Soccer over the much more popular Football, Basketball or Baseball sports at the time? Tony Sanneh: I visited The Gambia when I was 6 years old. My father is from there and I fell in love with the sport there. FF: When was the first time you realized that you had a chance at becoming a professional? TS: I never really said I was going to be a pro but all my actions pointed to it from a pretty young age. I would say when I was a junior in high school I started to realize I saw the game a little differently then others. FF: You played for about 5 years in Germany with Hertha Berlin and FC Nuremberg, what was the hardest thing to adjust to in Europe having never played club football outside of the USA before? TS: The hardest thing about playing in Germany was the language and cultural change. We are taught to enjoy the game, be positive and have fun (In the US). They see that as goofying-off sometimes. FF: In 1997 you were called-up to the USA national team squad. Do you remember your immediate reaction? What was going through your head? TS: I was happy I got called in and was excited for the opportunity. It really was not a big day because playing with DC United I had already played against most of the players. The cool thing was I got to play for my country. FF: For the USMNT you played under Steve Sampson and Bruce Arena. Can you recall the major differences between the two? TS: Bruce had a lot more trust in me, but both noticed I had qualities to be versatile. Bruce was a much better motivator and communicated more. Steve was more hands on in practice. FF: You’ve played in the MLS both when it was a brand new league and finished your playing career in what I like to refer to as the “modern” MLS. The league has come very far since 1996, but if you could change one thing about Major League Soccer, what would it be? TS: If I could change one thing it would be to have free agency. At this point I think with a salary cap single entity is not necessary. I would also like to increase minimum salary. FF: The 2002 World Cup must hold a special place in your heart, having played every minute of every US match during a very successful run to the quarter-finals. Which matches stick out first in your mind when someone says 2002 World Cup? TS: I think the Portugal game because we played against a world power. I marked the reigning player of the year (Luís Figo) and it shocked the world. And I helped create two goals. The Mexico game was a better individual game for me and we took over our region for a bit. FF: The USMNT performed admirably this past World Cup in Brazil. Did you have higher or lower expectations of them? How do you think they did? TS: I think for our country they did well because they were able to get results. I do not think the team was or played particularly good. The 2002 team was better, playing wiser and played more, but this team was more mature in having a winning mentality. This team will really help America's future because there is a different kind of belief that they belong on the world stage. That will help generations to come. 2002 we realized we could beat anyone, in 2014 we realized we should be expected to beat anyone and have the mentality to get the win. FF: If you could choose one more club (anywhere in the world) to play for, which would it be? TS: I would love to play for Arsenal, but I would love to go back and put on the DC United Jersey one more time as well. FF: You've established a great organization called The Sanneh Foundation. It helps establish a positive environment for urban youth (among many other things). It must have been a huge decision to undertake a project like this one. What led you to realize that this is something you would like to be involved in? TS: I started the foundation because I had the ability and responsibility to give back. I wanted to be in sport and education, but I did not want parents paying me and telling me what to do. We truly make decisions in the best interest of children. I also found I was good at programming which inspired me to do more. FootyFair would like to thank Tony Sanneh for his time and wish him the best of luck in his present and future endeavors.